Netgear Orbi Outdoor Satellite Announced | Nerd Much? The great outdoors...now with more Wi-Fi. 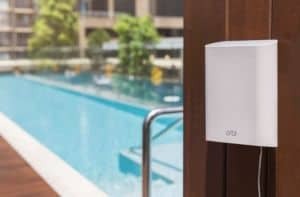 The first bit of CES 2018 news has been trickling out since the new year rang, and today, we have our first bit of concrete news from router company Netgear, which has just announced their latest addition, the new Orbi Outdoor Satellite. The idea of the Orbi line is simple: get a mesh Wi-Fi system that’s super easy to setup. But like most Wi-Fi systems, the Orbi didn’t stretch outdoors much, unless you plugged one of the satellite speakers into an outlet outside of your home. Today, however, that’s changing, as the Orbi Outdoor Satellite brings high-performance Wi-Fi to your backyard. Netgear claims that the new product will potentially add up to an additional 2,500 square feet of Wi-Fi coverage to your home, allowing you and your family to enjoy those sweet, sweet 4K Netflix vids poolside. You can also use multiple Orbi Outdoor Satellites together to extend the mesh network reach even further. The press release also notes that the unit is designed to withstand some rough outdoor weather conditions, including sub-zero temperatures, and it has an IP56 rating for dust and water-resistance. There are also flexible mounting options, as it can be mounted on a stand or to a wall. Want to bring DIY videos to your garage? Want to stream Spotify to your outdoor speakers without any interruptions? The Orbi Outdoor Satellite sounds like a great option, that is until you look at the pricetag, which is $329.99 for just the satellite, itself. Of course, users will still need the Orbi router for it to work, so it’s not a standalone product, which means if you don’t have one already, you’re looking at quite a hefty investment just for some Wi-Fi by the grill. Still, in our tests of the Netgear Orbi, we found it was quite a substantial improvement on our home’s Wi-Fi. The Netgear Orbi Satellite is available now. Looking for satellite internet? HughesNet plans may be the best solution for you.